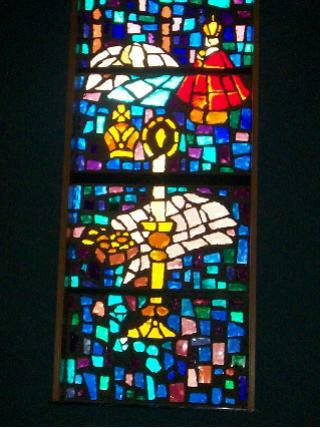 The faceted colored glass windows of the church were installed in 1969. The main events in the history of The Infant Jesus of Prague are illustrated by the artist in the pictures and symbols. 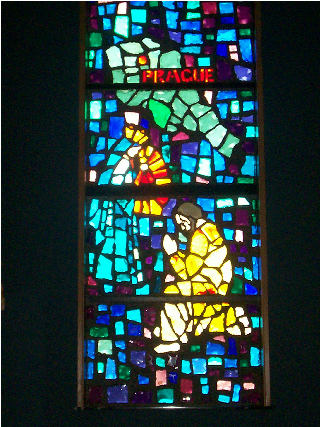 The country of Czech Republic is depicted in the upper part of the window with its city of Prague noted, in which the devotion to the Infant Jesus of Prague had its beginning. We see the figure of the noble Lady Polyxena Lobkowitz giving the statue of The Infant Jesus to a kneeling Carmelite friar in 1628. She is to have said, "I bring you my dearest possession. Honor the Infant Jesus, and you shall never want." In this window, the statue of the Infant Jesus is in a horizontal position with its hands in the middle of the window separated from the statue.During this time, the Thirty Years War was in progress. Prague was under siege several times and finally was overcome and pillaged by the armies of Saxony in 1630. The Carmelites fled and the statue of The Holy Infant was tossed into a storage area behind the main altar by the mercenaries who occupied the monastery of the Carmelites and the Church of Our Lady of Victories. Five years later, in 1635, after the Treaty of Prague, the Carmelites returned to Prague and to their monastery. In 1637, a Father Cyril, who had also fled in 1630, returned to the monastery. He, having a great devotion to The Infant Jesus, found the statue in the storage area but with its hands broken off. Father Cyril eventually found a benefactor who had the statue repaired. At the bottom of the window is the repaired statue of The Infant Jesus. Often The Infant Jesus of Prague would grant the petitions of the petitioner. This is represented by the statue of The Infant Jesus of Prague beside the bed of a sick person. When their petitions were answered, people would express their gratitude to The Infant Jesus with gifts, e.g. gifts of money as signified by the bag of money; gifts of vesture as signified by the golden crown; gifts for the Shrine Chapel as signified by the candle. 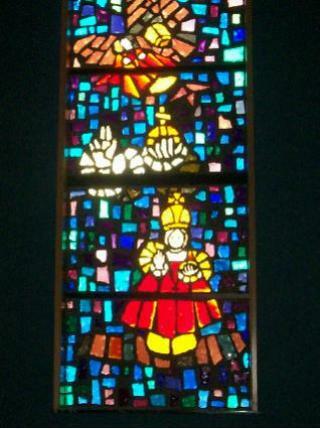 This window continues to depict the gracious and abundant response of The Infant Jesus of Prague. Those who display his statue and give Him honor will not suffer want as represented by the wheat, grapes, cornucopia, and the bag of money. In this window, a statue of The Infant Jesus is shown with rays extending from it. To the right is the depiction of a church with a statue of The Infant Jesus of Prague appearing to enter it. The globe of the world is in the lower part of the window with statues of the Infant Jesus of Prague around it. This represents the popularity of the devotion reaching out to other parts of the world. Churches without number soon displayed the statue of The Infant Jesus of Prague. 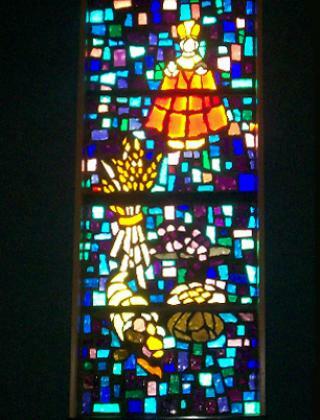 This window represents the establishment of The National Shrine of the Infant Jesus of Prague at Prague, Oklahoma. 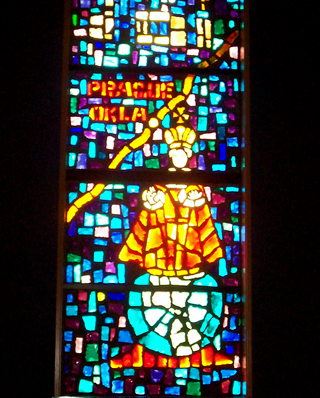 Note the building of St. Wenceslaus Church and The National Shrine at the top, the location of Prague, Oklahoma, marked by a dot on State Highway 99, depicted by the orange line crossing through the window. 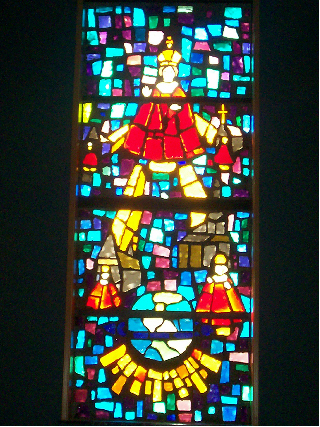 In the lower portion of the window, is the Infant Jesus of Prague on the globe of the world. This replicates the outdoor granite monument of the globe with the marble statue of The Infant enthroned above it which is situated at our entrance from Highway 99.